Is the volcano part of Santorini or is Santorini part of the volcano? Most people would say that this magnificent volcano is part of the island, one of the features that make it so unique. Then there would be others who would tell you about Santorini's history and prove that since it was shaped by the volcano, it's part of it. But none of these sounds like it's even remotely close to the truth. Both the island and the volcano are prominent, interacting with each other. The volcano erupts and shapes the island, while the island uses the volcano to attract visitors. But that's not the way it's always been. The volcano and the island share a great history. It all started two million years ago, when the magma first broke out of the depths in which it was formed and appeared on the surface of earth. It took thousands of eruptions since then to build up the island of Santorini, eruptions that were often violent enough to add a new layer of earth and rock to the island or even demolish a large part of the volcano. The last of these truly catastrophic eruptions occurred 3600 years ago, during the Late Bronze Age. 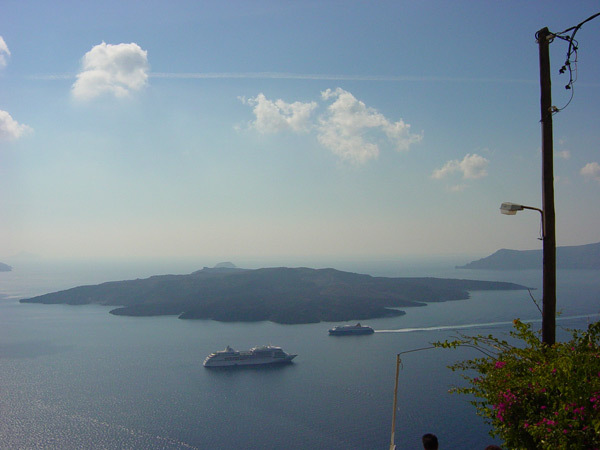 You might have heard about it; it's the first tidbit of information you'll probably stumble upon if you decide to search the net for information about the Santorini volcano: "The Minoan Eruption". This tremendous eruption ejected into the air 30 cubic kilometers of magma in the form pumice and volcanic ash. This material buried the island and along with it a civilization that had been vibrant with life. This total catastrophe, taken together with the collapse of the volcano in the eruption, gave rise to the legend of Lost Atlantis. In that eruption, the Strongyli volcano collapsed, creating the huge cauldron of caldera we see today. 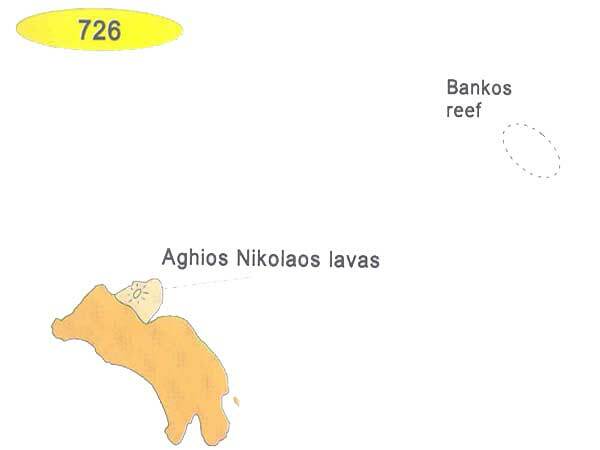 The Santorini islands complex (Thira, Thirasia and Aspronisi) are the fragments that remained above the surface of the sea after the collapse, while the rest, greatest portion of the island, disappeared under the water. 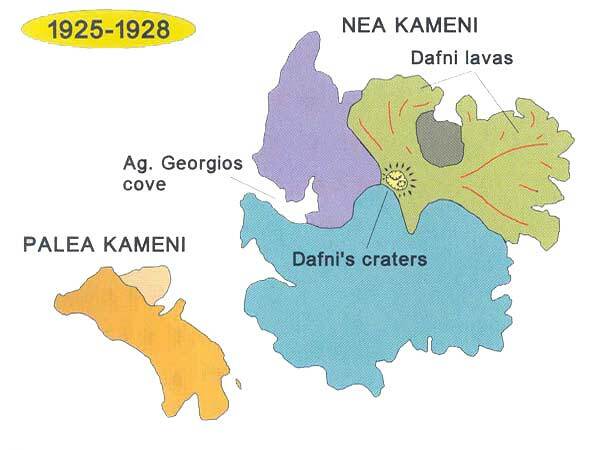 Not long after the caldera was formed, molten rock, viscous magma with few gases, again began to flow up in the centre of it, solidifying in contact with the seawater and thus slowly building up a submarine volcanic structure which would eventually become the foundation of the Kameni islets. Towards the end of 46 and the beginning of 47 AD, the volcano re-awakened. Huge quantities of magma spouted out of the sea two kilometers southwest of Iera (the island as it was described and named by Strabo), creating the islet of Palea Kameni. 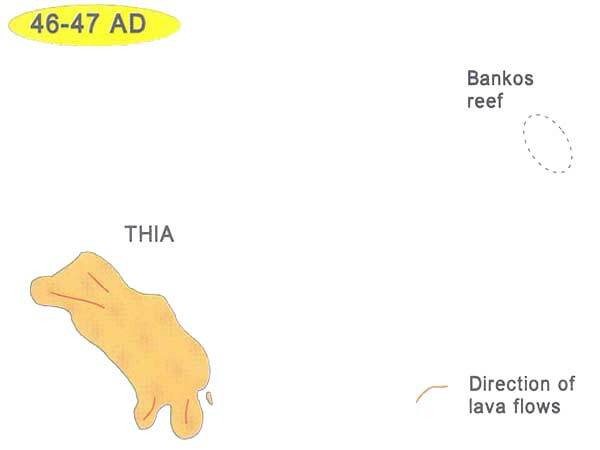 At the time the islet, which was known as Thia, had a circumference of 5500 meters. Its present shape was acquired gradually through fragmentation by great cracks and faults and the collapse of its shoreline in several places. After the eruption of 46, it took nearly seven centuries for the volcano to become active again. This time, several explosive events spewed pumice and volcanic ash several kilometers into the air, sending it drifting across the Aegean and into Asia Minor. Great quantities of volcanic tephra spewed out in this eruption can still be seen on Palea Kameni. This magma which later filled the crater now appears as a black tongue of lava with a rough scoriaceous surface on the northeastern shore of Palea Kameni, forming the north side of the bay of Agios Nikolaos. After the rather violent explosive eruption of 726, it took nearly 800 years for the volcano to plan its return and strike again. 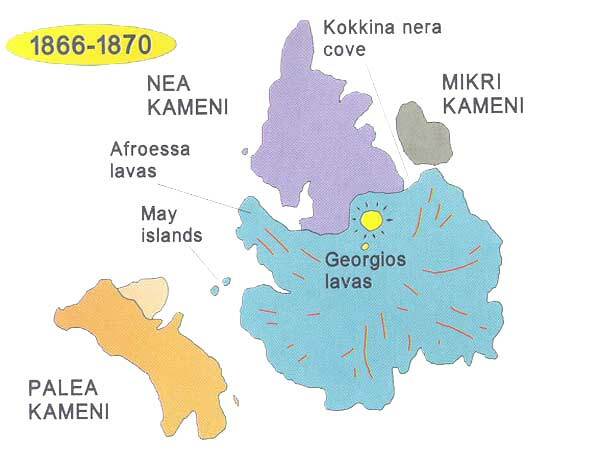 That happened in 1570; from an area near the "Bankos" reef, the remnant of the islet of Iera, flowed viscous magma punctuated by numerous explosions. This activity continued for about three years, creating a small dome-shaped island with a diameter of about 400m and a height of 70m, which was called Mikri Kameni. No signs of activity were shown from the volcano for the next one hundred and thirty-five years. That was until May 18, 1707, when minor seismic events took place. 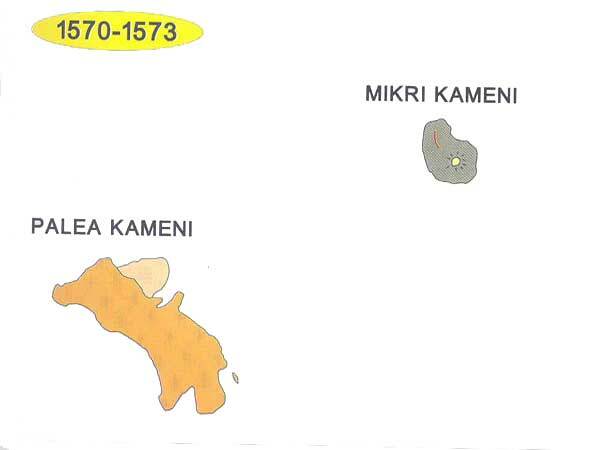 A few days later, the inhabitants watched the sea floor to the west of Mikri Kameni slowly rise to the surface and become dry land, bringing with it to the surface great qualities of shells. The new islet was called Aspronisi (White Island), because the land that had arisen from the bottom of the sea was white with pumice. 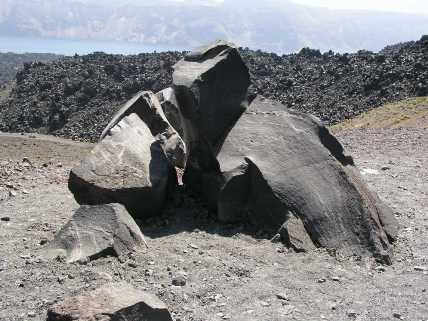 A week later the magma made its appearance to the north of Aspronisi; this new islet, formed of black chilled lava, was called Mavronisi (Black Island). A few days later there began a series of explosive eruptions, spewing tephra and lava fragments to a height of up to two kilometers. 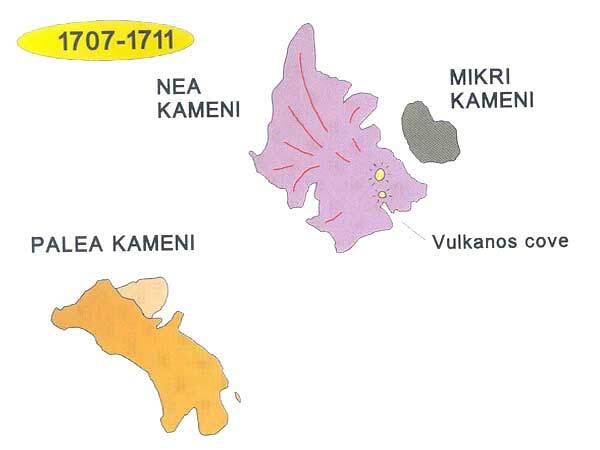 This volcanic activity continued for more than four years and by September 1711 had created alongside Mikri Kameni a new island, which became known as Nea Kameni. The volcano remained quiescent for only 55 years after the eruption of 1707. Its dormant stage was soon interrupted in 1866 by a series of seismic events which continued over a period of two week. 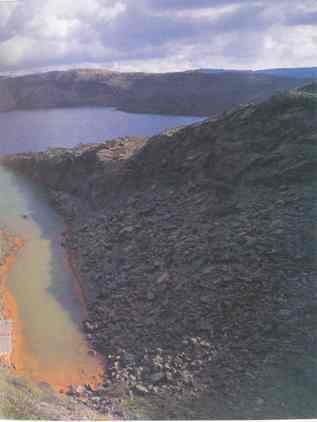 The waters of the eastern shore of Nea Kameni became noticeably warmer and the sea was colored by fluids seeping from the magma that had begun to rise. The first lavas appeared on February 4th, in the middle of the cove, and two days later the eruptions began, increasing in number and sending lava fragments to a distance of more than 700 meters. The activity continued until October 15, 1870. 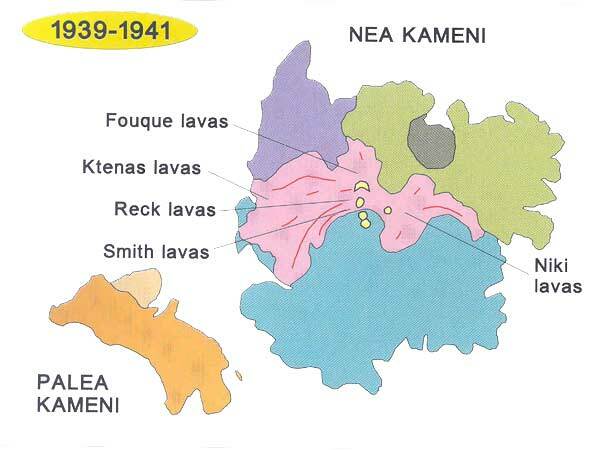 The quantities of lava produced during this period tripled the size of Nea Kameni. 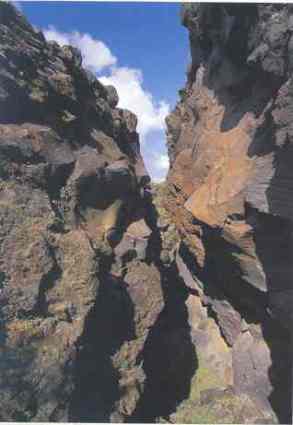 A small strip of sea continued to separate Mikri from Nea Kameni; this area became known as Kokkina Nera (Red Waters). It was a series of minor seismic events on July 28, 1925 that warned the inhabitants of Santorini that the volcano was about to re-erupt again, after 55 years of quiescence. 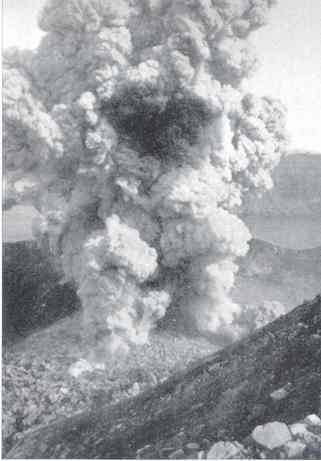 The eruption began on August 11, 1925, two weeks later. The fountains of steam and waters which had appeared in the area of Kokkina Nera became explosive columns ejecting lava and volcanic ash. The center of volcanic activity moved 200 meters to the southwest a few days later, creating at least 5 craters grouped together at that site. 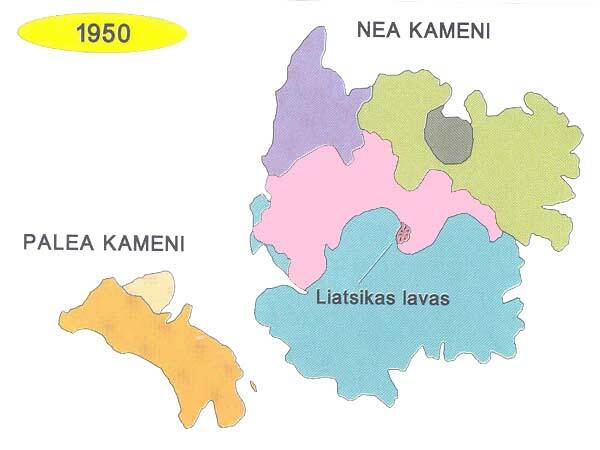 The explosive activity was accompanied by the ejection of huge quantities of lava which flowed in two broad branches, one to each side of Mikri Kameni, filling in the channel separating it from Nea Kameni. The period of activity lasted for two years, until May 1926. 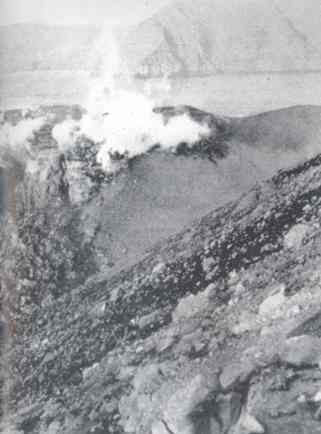 The volcano reawakened briefly during the first three months of 1928. After the eruption of 1928, the volcano's dormant period lasted for only 11 years. Early in May 1939, it was observed that the waters in the little bay of Agios Georgios were heating up and the coastline was subsiding. But the vent that was needed for the new magma to begin to appear was created by a submarine explosion at the harbor entrance on August 20 and when it did, the magma created a small dome. One month later the focus of volcanic activity shifted a few hundred meters to the northeast and between November 1939 and July 1940 even farther, where it created lava flows and domes. In August 1940, two major explosions from the summit of the island blew the old rock plug from 1866 into the air, opening two large craters each 50 meters across. These are the craters which visitors to the island today go to see. There was no magma outflow from these craters. On August 1949, the first warnings that the volcano was awake again took place in the form of seismic events. But it wasn't until January 10, 1950 that the volcano erupted, when an explosion blew the old rock plug to the southern foot of the Niki dome and opened a vent for the new magma which began to pour out. Intense explosive activity took place, which spewed tephra 1000 meters into the air and dropped lava fragments within a range of 850 meters all around. 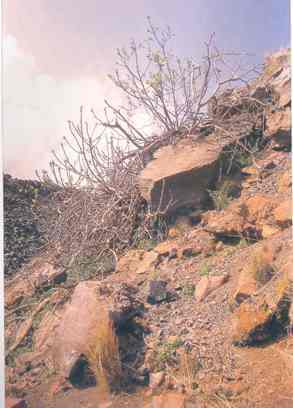 The explosions and the effusion of magma continued until February 2, creating the youngest volcanic rocks in Greece. 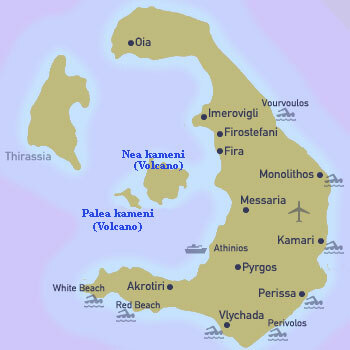 The eruption of 1950 is the most recent eruption of the Santorini volcano. 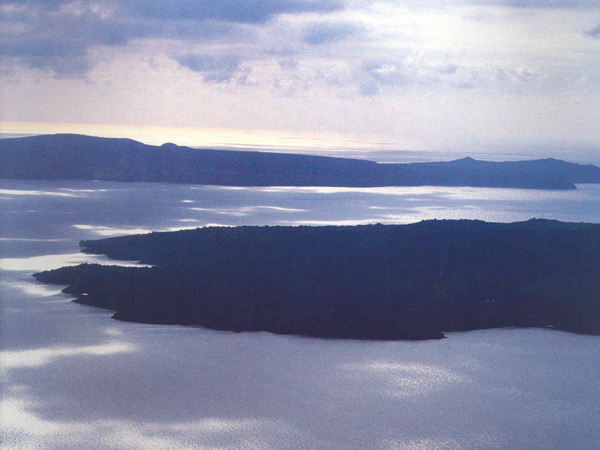 The volcanic centers of the Kameni islands have remained dormant since the volcano's eruption in 1950. The only surface reminders of the magma that still underlies the islands are the numerous thermal springs that dot their shores. 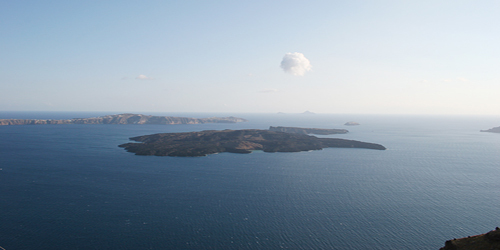 Thankfully, a state-of-the-art integrated network monitors dozens of physical and chemical parameters on the islands of the Santorini complex and the surrounding area. 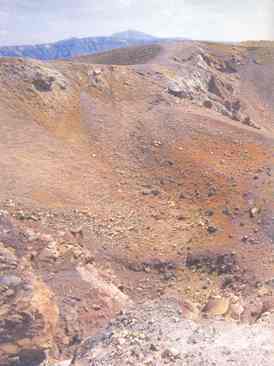 This network ensures that the slightest precursory manifestation or phenomenon indicative of a possible reawakening of the volcano will be recorded, thus permitting measures to be taken in plenty of time to ensure that visitors to the islands will run no danger if the volcano should be awakened.